Reliable Work Companion! This Tundra offers best-in-class legroom, according to Toyota, and offers the only reclining and sliding rear seat among pickups. It also offers One of the best-designed interiors, with plenty of storage space and easy access to the backseat area. Safety is also a strong selling point, with Tundra's stability control, front side airbags, front seat knee airbags and rollover-sensing side-curtain airbags. 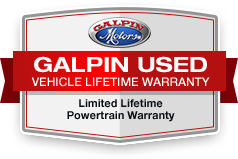 Call us today to own this time tested reliable workhorse and experience 'Galpin Used Car Difference'. All figures are EPA estimates. Actual mileage will vary. Kelly Blue Book values are calculated based on the current Retail Book. Please confirm the accuracy of the included equipment by calling us prior to purchase.